Chair of this afternoon´s panel was Enrique Alonso, Permanent State Councillor of Spain. What is an Ag-Gag Law? It is a law that seeks to criminalise the recordings, possession or distribution of material taken undercover from agricultural facilities. Of course producers do not want us to know what happens on their farms - and we all know what cruelties are being perpetrated - so they lobby fiercely the legislator to achieve the passing of laws to restrict and criminalise the exposure of such material. These abuses are not categorically different and we are talking of 10 billion plus animals every year. The Ag-Gag Laws movement started in the 1980s. Rather than changing their behaviour, the agricultural facilities pushed to change the ability to know about them. In the USA, Iowa and Utah had the first Ag-Gag Laws, but soon other states will follow. The interesting fact is that most of this behaviour was already illegal. You cannot go in a private facility and start taking pictures, you cannot misrepresent yourself in the hiring process, and so on. So why is it more illegal? The objective is to make it harder for activists to do what they do. With Ag-Gag Laws we set higher penalties targeting specific content based behaviour. Actually the American Constitution protects the freedom of expression, so states try to tiptoe around these constitutional principles and who draws these laws is very smart and overleaps the constitutional challenge. But why? The legislators declare that the objective to protect the agricultural industry from inaccurate representation i.e. misrepresentation by dishonest activists. And why does the industry want to protect itself? These question is connected to the following ones: so are these laws constitutional? Why are we even having this argument? Why would it make sense to criminalise a behaviour which is already criminal and actually exposes acts, which are arguably criminal? Why do have this discussion if this behaviour (exposing material is so outrageous? Well beacuse the industry is not transparent. A further issue connected with the Ag-Gag Laws is "the victim vacuum". We have animal cruelty laws but who is the victim? If an animal is being tortured in front of a kid, it is considered "aggravated" beacuse the child had to witness the cruelty and brutality of the act. But in agriculture these billions of tortured animals are not victims. And even if the protection should reach them, we criminalize the exposure of the cruelty the undergo, thus creating a victim vacuum. Those who are perpetrating the cruelty lobby the legislator to get protection, therefore becoming the victims. The legal system has gone mad and the constitutional question is still open (in particular the Legal Defence Fund is actively working against the Ag-Gag Law in Utah). Prof. Martine LaChance "Impacts of Religious Beliefs on the Protection of Animals"
To cover this issue we have to start with the religious references. First of all the Islamic Law sources comprise the Koran and the Sunna of Muhammad; practicing Muslims are only allowed to eat Halal food. Secondly Jewish Law sources comprise the Bible, the Mishnah, and the Talmud; faithful Jews are only allowed to eat Kosher food. Furthermore we need to mention the prohibition against the consumption of blood. Bleeding is contrary to Christianity, Judaism, and Islam because it is a religious belief that all living creatures have and the soul is transmitted by blood. Regarding the prohibition of eating the flesh of a dead or damaged animal, as long as an animal shows signs of life, it may be bled and its flesh consumed by a Muslim or Jew; the practice of stunning is not allowed according to both religions for fear that the animal might not be alive anymore while it is bled. The religious texts are silent about the manner of the slaughter. Yet, what is generally done follows a very precise ritual, some steps of which are: ensuring that the animal is alive, the performer must be a believing Muslim or Jew, he must repeat the mandatory religious invocation, the bleeding must be performed by a sharp instrument, the performer must accelerate the bleeding as soon s the animal has been immobilised in order to avoid pain and stress, he must act carefully to ensure that the tracheas artery, the oesophagus and the jugular veins have been cut. 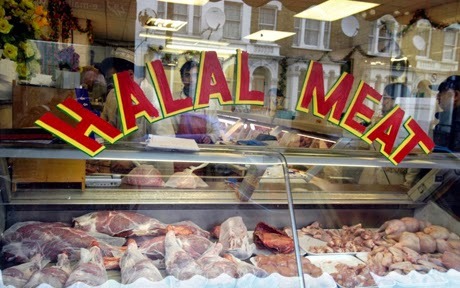 The markte for Halal products representas a €400 billion business: 9 billion in the USA, 4 in Germany, 3,5 in France and Great Britain. On the other hand the market for Kosher products represents a business of €147 billion in the USA alone; €5 billion in Europe. In spite of the economic element the commune position if many states shows that religion is not a sufficient justification to such animal suffering. Examples of countries that prohibit ritual slaughter without stunning are Australia, New Zealand, Switzerland, and also across the European Union. In this issue the difficulty is represented by the unclear understanding of the Finnish legal base to establish the competence, related to the legal status of poultry. In Finland, during 2004-2007, 16 administrative actions were taken by the regional animal protection authority and local veterinarian offices (State Provincial Office) for turkey meat inspection control at slaughterhouses. Substantially the cases referred to the transportation and keeping of turkeys in a way that caused them undue pain and suffering (too long in the cage, too many animals per load, too cold/hot, too little space). Nine of these cases went up to the Administrative Court and three of them to the Supreme Administrative Court for final judgement. The Court confirmed the administrative decisions and interpretations of the law made by authorities were legally valid. During 2006-2007 four of the cases landed before the General Court for judgement. In two cases the slaughterhouse was punished for animal welfare offence, yet, none of the lawful decisions has been pu tinto effect. Why? The main arguments are two: the first one is that there is no scientific proof that this method causes undue suffering (of course the economical interests of the industry are a tool of massive lobbying) and the second one states that the position the turkeys have to assume in the transportation box is a natural low standing position of the animal. Nevertheless, as a conclusion we can say that judicial decisions cannot be based on natural science or on the lack of it. The decisions have to be based on the law, and the law and legal understanding have to be changed over time. The future step must be to declare animals as legal subjects and grant them constitutional rights. What message will we get from the regulatory process and how will it be enforced? Codes are necessary and good because general duties are the alternative and provide a general duty of care. They create an illusion of a neutral, scientific driven process conducted by the government, but they are written by the industry. The government, however, provides funding. They create an illusion of a legal process. The Codes have no independent force and some provinces refer to Codes as providing “defense” to farmers who comply, while other jurisdictions may see them as evidence of reasonableness. Codes should be mandatory in every jurisdiction. The decisions are made by an “unbalanced table” consisting of many producers and very few animal welfare advocates/veterinarians. Code development committees make value based decisions. There is a 60 day public commentary process and there is no mandatory reporting of public comment or reply to the public. National Farm Animal Care Council (NFACC) is the agricultural industry made up of 90% of industry organizations and only 10% humane societies/veterinarians. There is no government involved in NFACC, and thus no government oversight. The industry is thus not accountable to the government.